In this jazz guitar lesson you will learn how to play the melody and the chords of the famous jazz standard Autumn Leaves. This course with tabs, standard notation and chord diagrams runs in progressive steps. 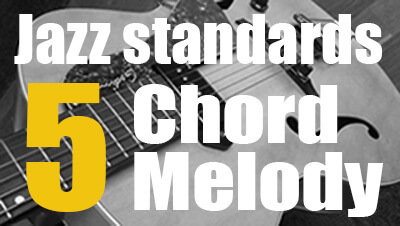 The ultimate goal is to play the chord melody arrangement provided at the end of this blog post. Guitar Chord melody arrangement with harmonic analysis for beginners of the jazz standards solar by Miles Davis. Tab, standard notation, chord diagrams and audio file.